A police officer is patrolling the neighborhood when he gets an urgent notification on his phone: the face of a passerby matches that of a suspect in a police database. He touches a button to request backup and glides his hand to his holster. Since then, that idea has zoomed from science fiction to fact. Casinos, merchants, and police can now identify individuals captured on high-quality surveillance footage in mere seconds, thanks in part to advances in AI and cameras. Also new to the face recognition challenge: cloud-connected databases swelling with faces. Face databases used by local law enforcement now contain over half of the U.S.’s adults, many of them people who have never committed a crime, according to a 2016 study by researchers at Georgetown University Law Center. As internet companies gather their own collections of faces–encouraging users to upload them themselves–researchers are developing ways to scan facial features for possible signs of fear, sexuality, and other traits. Motorola Solutions and an AI startup, Neurala, said they planned to release a police body camera this year “to more efficiently search for objects or persons of interest, such as missing children and suspects.” The companies later said the cameras would only look for objects like shirts or hats, but not faces. Given the absence of any comprehensive laws that govern the technology’s use–and the growing Orwellian and Kafkaesque alarms of privacy advocates–Smith says the company isn’t implementing face recognition yet. Instead, in April the police giant–no stranger to decades of controversies surrounding its Taser weapons–sought to get ahead of the AI controversies by convening an ethics board of advisers to weigh in on the company’s policing tech. “Because if you get that wrong, you give up all the work that you’ve done to strengthen public trust, all the work that police departments are doing to work with communities post-Ferguson,” says Mike Wagers, vice president of Axon Ecosystem, who is leading the ethics effort. In the months since Axon’s announcement, face and object recognition software has become the spark that has set off PR wildfires and internal discord at companies like Google, Amazon, and Microsoft. Google issued a new set of ethical standards for AI and said it would not sell software to be used in weapons or surveillance “violating internationally accepted norms.” Microsoft touted the work of an internal ethics committee and said it had turned down some customers “where we’ve concluded that there are greater human rights risks.” Some startups building face recognition say they won’t sell their products to police at all. “Whether or not you believe government surveillance is okay, using commercial facial recognition in law enforcement is irresponsible and dangerous,” Brian Brackeen, the CEO of Kairos, wrote in an op-ed. Among the partnerships Brackeen said Kairos turned down was a request from Axon. So far, the company has largely avoided the recent controversy around face technology, but dissent is brewing. One of its new ethics advisers–the board’s only attorney–and the company’s former head of AI think face recognition software is a no-no. Axon’s former head of AI also sought a ban on the technology. “The ethics side of our work is incredibly important,” David Luan wrote on his website. “I am responsible for the efforts at Axon to establish an AI Safety/Ethics Board and a blanket ban on facial recognition on body-worn cameras.” Luan, a founder of an AI startup named Dextro that Axon acquired last year, quietly left the company in December. He did not respond to a request for comment. Face recognition–even real-time automated face recognition–may sound acceptable in certain cases: searching a crowd for active terror suspects, a missing child, or a dangerous fugitive, for instance. Scanning the faces of unknown persons, either with their consent during a police stop or in surveillance footage, is an increasingly common police practice. Last month, in one of the highest profile cases yet, police used a state database to identify a suspect arrested for a shooting at a newsroom in Annapolis, Maryland, after he refused to cooperate with police. Wagers, who is leading the ethics effort, conjures up an alternate version of his boss’s scenario: What if an officer’s body camera IDs the wrong guy? Still, aside from legislation in Illinois and Texas requiring that companies get consent before using face recognition software, no U.S. laws govern the technology. While government researchers have designed benchmarks for testing face recognition software, there are no industry-wide standards for bias or accuracy. Meanwhile, few government agencies or police departments have outlined rules about biometric technologies like face recognition. Out of 50 major police departments surveyed by the public advocacy research group Upturn last year, just six had policies related to biometrics. “The language that is now used about Facebook being weaponized–it really started with law enforcement,” says Tracy Ann Kosa, a member of Axon’s ethics board who has advised Google and the city of Seattle on privacy concerns. Kosa, for one, isn’t certain that a ban on the technology–be it by a company or a country–is ideal, given the challenge of enforceability. Friedman, an ardent advocate for a more democratic approach to policing who has previously questioned Axon’s cozy relationships with police departments, applauds its recent efforts. Still, he thinks the company would do well to inject more community members into its discussions. In any case, Friedman’s views and those of the company’s other advisers will ultimately have limited impact on the company’s decisions about, for instance, face recognition. “We do see a day when facial recognition, with the right controls and sufficient accuracy, could reduce bias and increase fairness in policing,” the spokesperson added. Electroshock weapons are still the company’s biggest sellers, but after a police officer fatally shot Michael Brown in Ferguson, Missouri, and sparked new calls for police oversight, Axon has become the dominant force in body cameras. The company has racked up contracts with most of the U.S.’s major police departments–who often pay a monthly software-and-storage subscription fee alongside the cameras–Axon has also sought to turn itself into a tech company, rebranding from Taser International last year and embarking on an engineering hiring spree. So far it has spent over $100 million developing a software platform that helps police officers organize video files or redact sensitive personal data–including faces and license plates–so that departments can more easily share videos with prosecutors and the public. A new app helps officers crowd-source criminal data and evidence. Eventually, Smith envisions a system for managing all police data, from dispatch information to police reports, and automatically analyze growing mountain of video, tagging objects, people, and behaviors: officer, weapon, expletive, bystander, use-of-force, and so on. In the future, such an AI-backed system, paired with sensors like body cameras, could help police not only write reports after the fact but “anticipate criminal activity” beforehand, the company said in a 2017 report. To civil rights advocates like Friedman, that’s precisely the kind of AI software that risks turning tools for transparency into something else. “The idea that we’re just going to be identified, threat scored, geo-located everywhere we go is terrifying to me,” he says. As ethicists debate the technology, it’s advancing quickly. Creating a working facial recognition system “requires not much effort,” says Mojtaba Solgi, Axon’s Director of AI and Machine Learning. “If you go to any computer vision machine learning conference there are papers about it out there, and you could assign a few researchers and engineers to come up with a working system in a relatively short time,” he says. Amazon, Microsoft, and an assortment of smaller companies already sell cheap plug-and-play face recognition software to police and government agencies. Using Amazon’s service, the sheriff’s office in Washington County, Oregon, built a web app that allows patrol officers to identify faces they capture on their smartphones or in surveillance footage. The system, which relies on an internal database, cost only around $400 for the initial setup and a $6 monthly fee. “It’s about helping us fight crime, solve crime, and find missing people,” deputy Jeff Talbot, a department spokesperson, told Fast Company. Last year, the department said that the system had helped generate leads on more than 20 suspects, but wouldn’t provide more recent statistics. Elsewhere, police are turning to more automated, near-real-time face recognition. Public security officials in China say software by Yitu Technologies has helped nab wanted suspects during pop concerts, by scanning footage collected at stadium entrances. NEC Corporation sells real-time facial recognition to large American companies and has been fielding inquiries about the technology from unnamed police departments in large U.S. cities, a company official told NPR. IBM, which sells its Intelligent Video Analytics software to law enforcement, notes that in addition to people counting and “lying body detection,” its algorithms can find known faces in archived body camera video and real-time surveillance footage, or it can simply gather “metadata” about the faces it meets. Top: an email from an AWS representative to an Oregon police official. 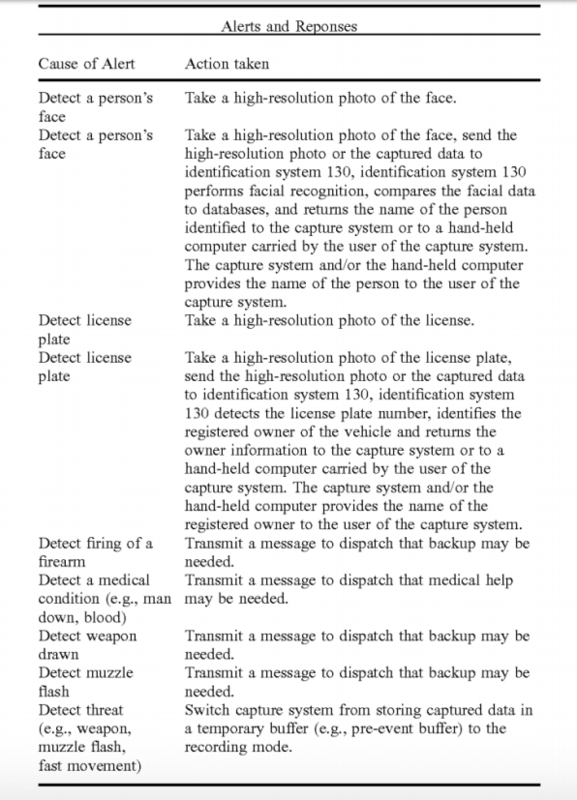 Bottom: Amazon Web Services described “Law enforcement bodycams” as one use case for its facial recognition software but has since removed that language from the webpage. Deputy Talbot said that the Amazon software was not being used in real-time or with body cameras: scanning faces on body camera footage is currently against Oregon state law. But in a series of emails from last year, two Amazon representatives can be seen arranging a meeting between a Washington County police official and a body camera maker to discuss how to sway public opinion on the issue. Axon’s board, which includes two police officials, will meet quarterly, publish one or more reports a year, and consult on new products in the pipeline. Members wil be compensated but the police officials’ fees will be donated to charity, Axon says. A handful of cities have passed ordinances that require police departments to seek public approval for new surveillance gear. but ultimately, Friedman says, more stringent laws are needed. Even Microsoft’s chief legal officer seems to agree. In a July blog post, Brad Smith outlined steps the company was taking to improve accuracy and transparency around face recognition and called for a “bipartisan and expert commission” to help the government steer the use of the technology. Weeks later, amid growing questions from lawmakers on Capitol Hill, Amazon’s Wood echoed the idea, updating a blog post to say that it is “a very reasonable idea” for government to weigh in. Cultural shifts are important too, notes Friedman: any rules around the technology will ultimately depend upon the people using it. “Ultimately, the rooms that matter are the rooms where the police departments themselves figure out how they’re going to use technologies in their own communities,” says Friedman. Axon conducts training sessions and offers departments guidelines for its cameras and stun guns, but it does not participate in writing local policy.